Ever since I saw this cake by Amanda (aka iammommy) last year, I’ve been obsessed with it. I’ve dreamt of the colours, the ruffles, the sweetness of it all… I just needed to wait another year for Christmas. Do you have any idea how frustrating that is? Yes, you probably do. 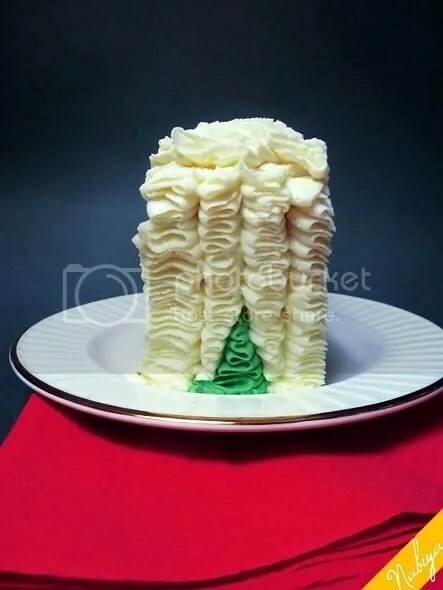 The only thing is that I’m not sure if I’m fond of the texture differences caused by the cake-ception like the one in this picture. 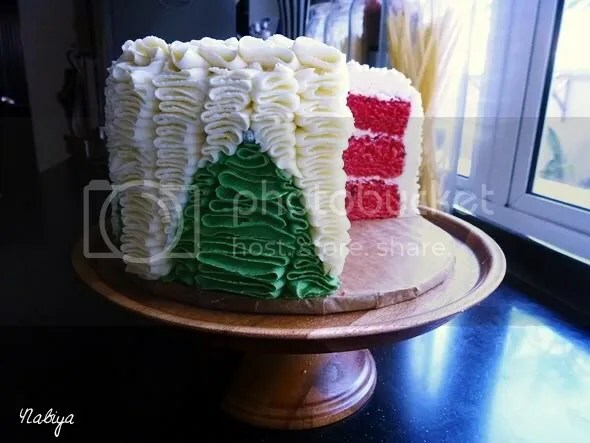 So with a year to think about what I want my cake to look like when I finally do it, I think I surprised even myself with how simple it was to make it over-the-top Christmas-sy! After many, many ruffle cakes over the past year (Elyza’s birthday cake, Lana’s engagement cake, personal pick-me-up-cos-the-week-was-so-shite cake, and many ruffled cupcakes) the ruffles just came so much easier this time around. I find that when it matters… my frosting and decorating always falls to pieces. This is definitely because I always try to do it all in one sitting, and by the time it comes to piping, I’m exhausted and my eyesight is wonky from the prolonged contact lenses to flour/sugar exposure. Last weekend was the perfect opportunity to try this out, because a) I had no work to do, and b) mum put me on house arrest for the weekend because of my back problem. Standing and baking all day probably wasn’t the best option due to point b) but I’d run out of TV shows, films and books… and wanted to bake. Pipe! 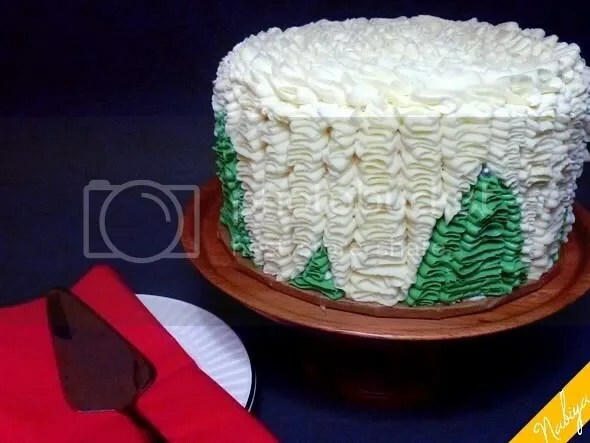 For ruffles, use a petal decorating tip (#104 for a slightly larger, taller cake though I used a #103) and starting at the bottom of the cake, with the bigger opening on the cake side, at almost right angles with the cake, just dash back and forth all the way up. This video might explain it better. And when you’re done, have cleaned up the kitchen and let the cake sit in the chiller for an appropriate amount of time (which basically equals to enough time for you to shower, get dressed and look presentable)… make yourself a cup of coffee (hold the sugar) and cut a slice of cake. I don’t even need an excuse to bake cakes anymore, my parents are no longer surprised, though they make “tsking” sounds whenever they find the fridge packed with desserts. 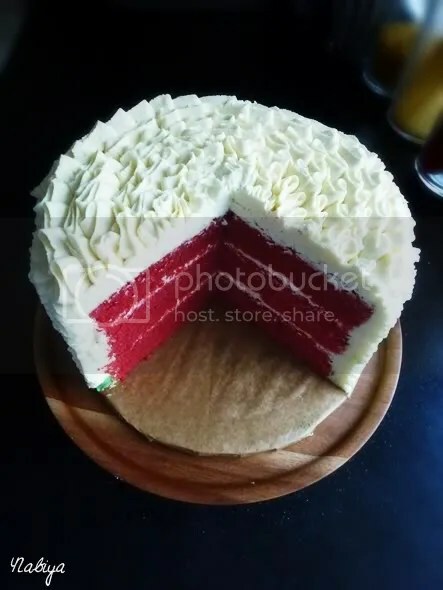 Every day is cake day! Especially red velvet cake. 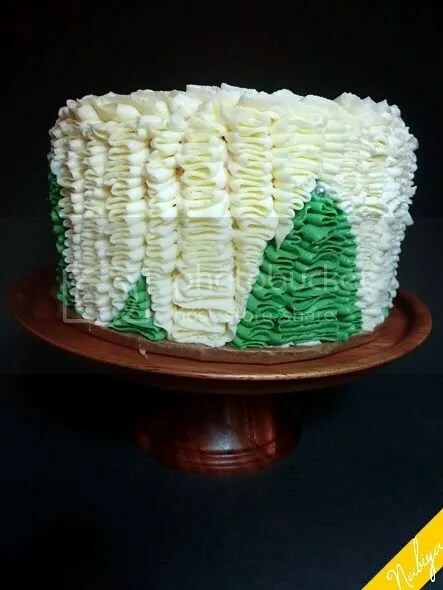 Look at how seasonal this cake turned out! My mum didn’t see me bake this, and when I cut a slice, it was gratifying to hear her gasp. Yay Christmas!